The reports were coming in almost as quickly as the feed could be interpreted. There were multiple landings on all sides of the fueling station. Principes Garlun Kuhr brought the Enervating Fist up and drew it back, ordering the rest of his maniple to form up around the strategic position in the hopes of keeping the loyalists away for just long enough. He had known they were coming but didn't count on the numbers opposing them, it wasn't that the enemy were more numerous, it was that they were surrounding his forces. He had to make a defensive circle to cover all of their angles and wouldn't have time to make adjustments. 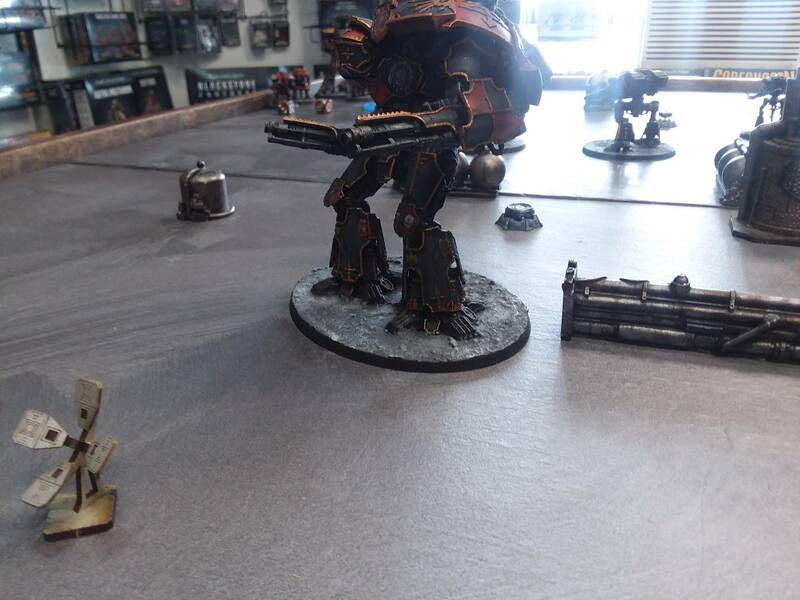 As the landers opened the Loyalist titans surged forward and his perceptions narrowed as the speed of Enginewar removed any other consciousness from his mind. The Loyalists advanced slowly, both fleets were in orbit above the planet he requested orbital support. 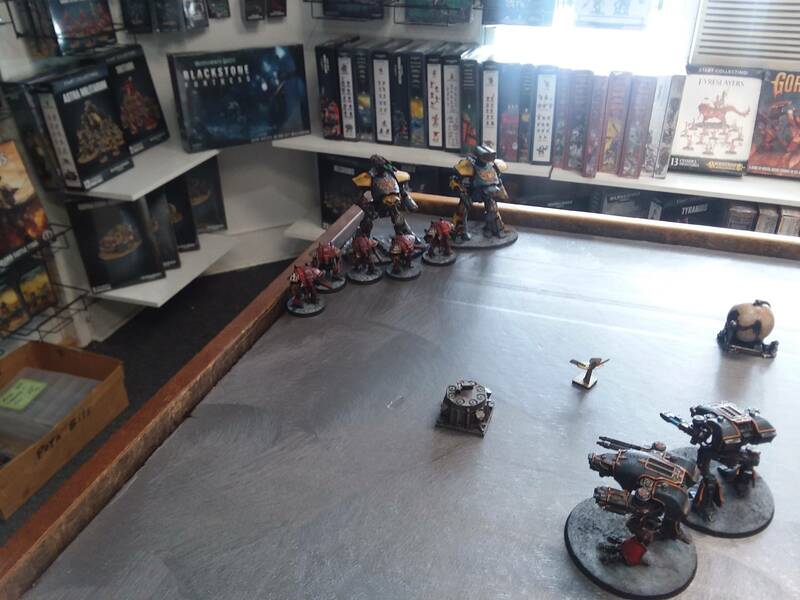 The lance hit struck a loyalist formation as it moved forward, vaporizing one of the knights at the leading edge of it. The loyalist fire was persistent but inaccurate, they had put themselves in positions that would wrong foot the Traitors whichever direction they turned. 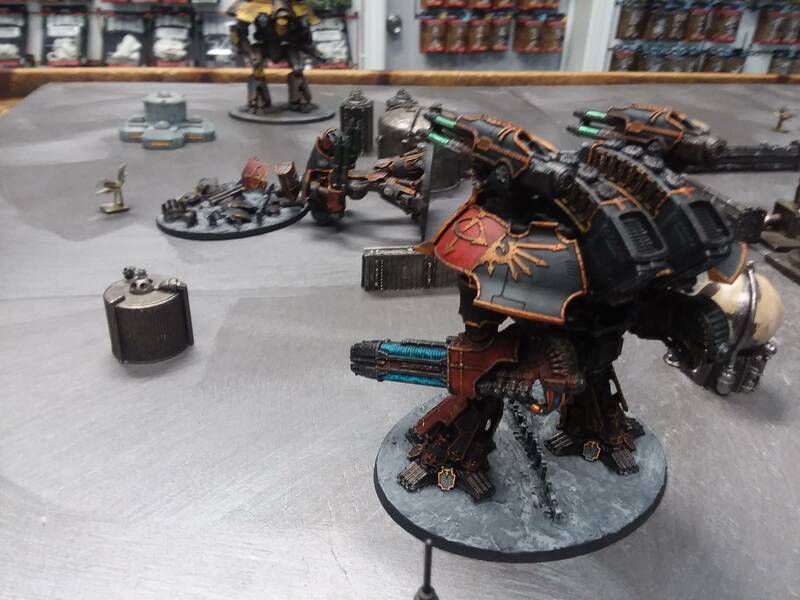 Impetuously his two Warhounds advanced on the enemy before he could order them not to do so. The Loyalist knights surged towards one of the scout titans while the two reavers in support of them blasted away the shields and armour of the other, a charge of the cerastus knights of House Malinax slowed the loyalist degradation of the Warhounds but could not stop it and as Kuhr brought the Enervating Fist around he saw one of the reavers' power fists smash the last of the lancers to pieces. It was a heroic, if futile, gesture. Soon the guns of the loyalist force blew one warhound up and the other was back-peddling as quickly as possible. His position untenable. 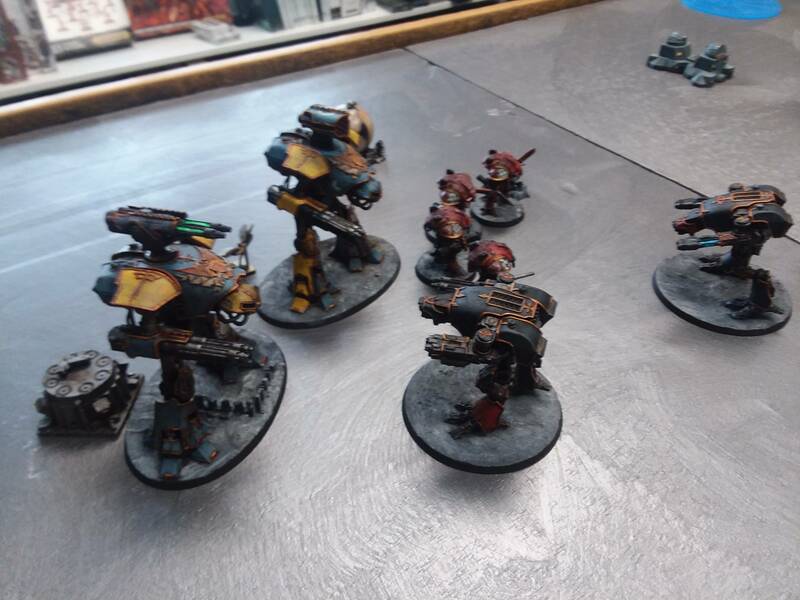 The loyalist knight-lancers had not survived longer but had much more cause to celebrate their sacrifice, the other Warlord in Kuhr's maniple had its main guns silenced by the plucky pair of knights. 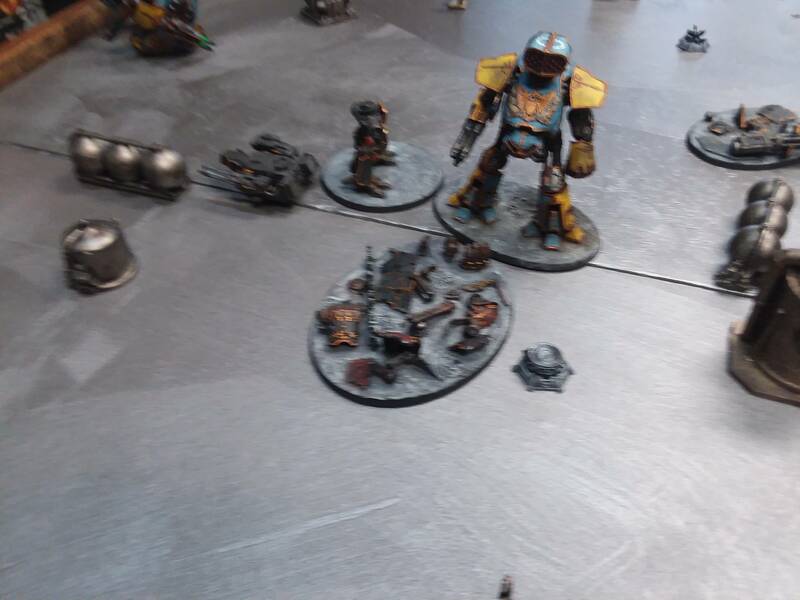 Kuhr could hear screaming from the principe of the Warlord to the overseers of the servitors to make the weapons functional while he tried to target the enemy at long range with his carapace weaponry. 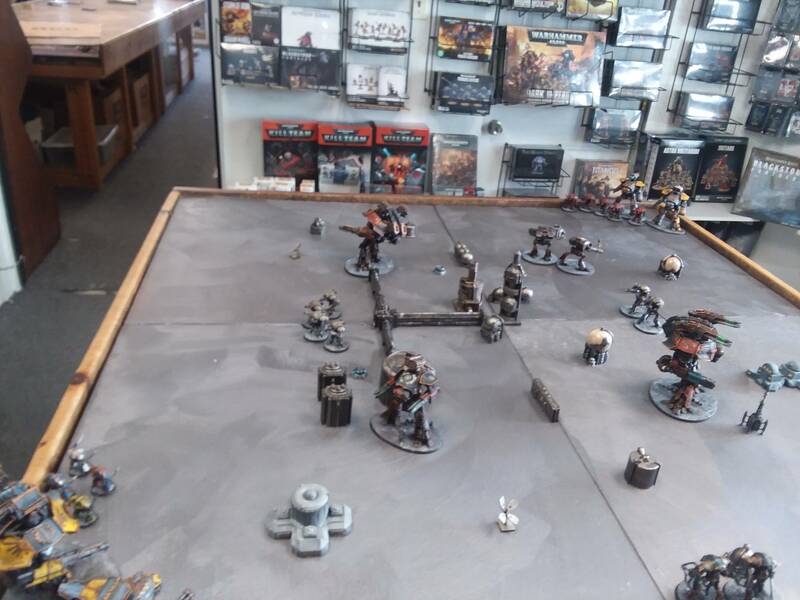 The loyalist advance on that side was stymied only by the heroic exertions of the lone traitor reaver. 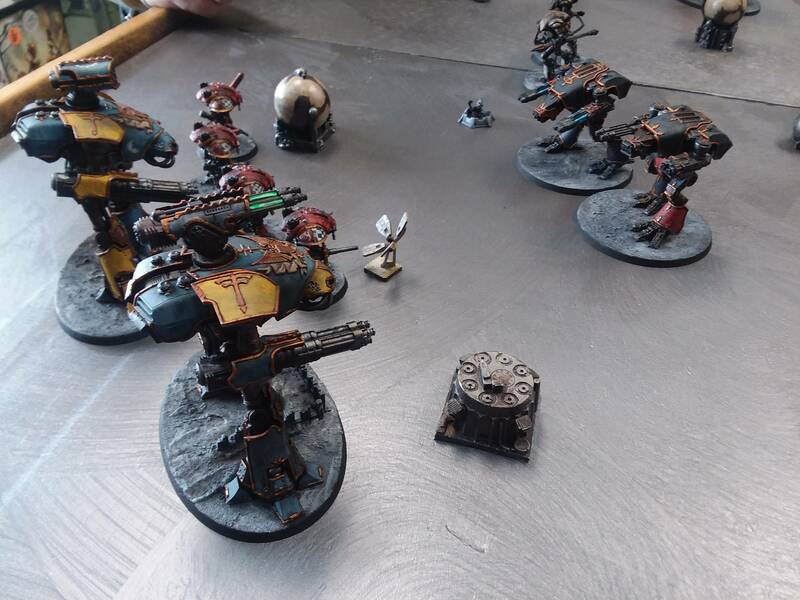 The machine took on both the enemy Warlord and a reaver by itself and managed to knock the reaver out as it succumbed to enemy fire itself. The situation was far from favourable though and Kuhr ordered the detonation of the Stella Adducere. 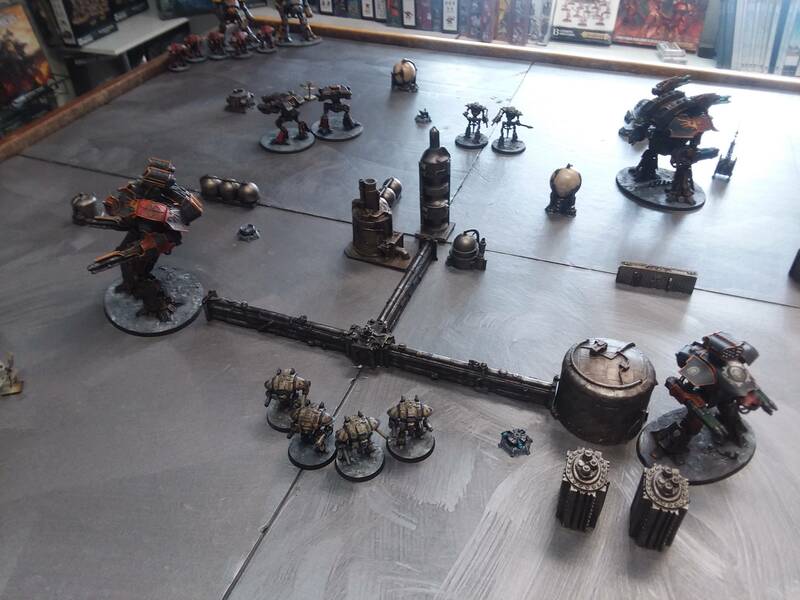 In the few moments that it took for the dark mechanicum to respond Kuhr's titan came under fire from the remaining loyalists who had scythed their way through all traitor engines in his sector. 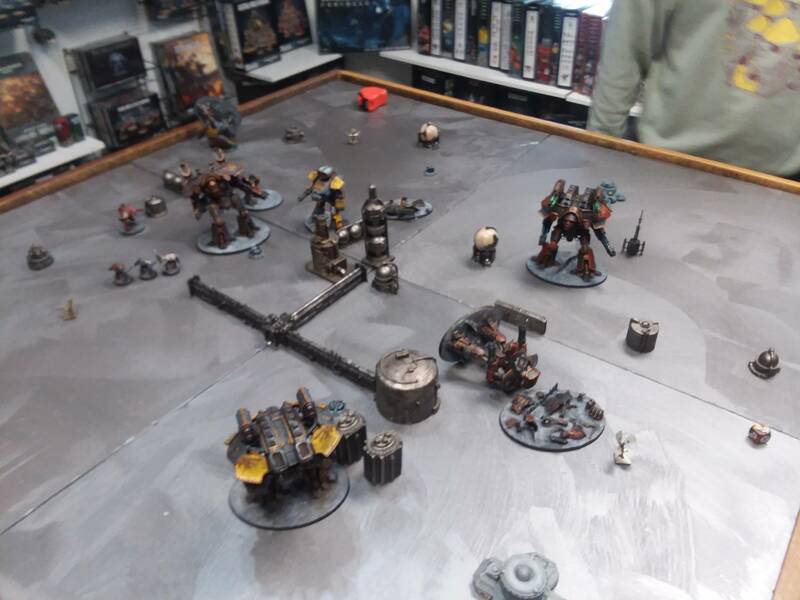 His void shields collapsed under the weight of fire as only the two traitor warlords remained, and the Enervating Fist was only one with functional weaponry, although under the fusillade that did not last long. He was soon sending out frantic orders for repair as he received the information that the solar flare was coming. He closed down his view ports and screened his sensors just in time. The respite was only momentary and while he could see the loyalists, blinded and scrambling back to their drop ships, he sensed the reaver that had come up on him still there. 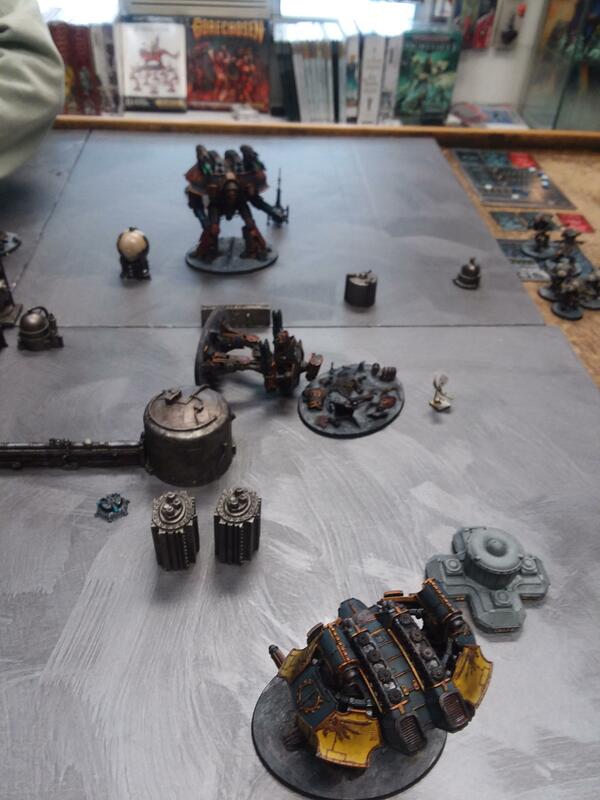 Before it could attack fire burst through the passageways in his machine as the enemy Warlord, despite being blinded had finally managed to land a volcano cannon shot. Reeling from this the Enervating Fist found itself the subject of a pummeling by the Reaver's powerfist. This close it could hardly miss and it did not. Kuhr watched his ammunition start to cook off as containment fields failed. There was another blinding flash then and the explosion bathed loyalist machines in its destructive force. Several were brought down by the explosion but enough managed to escape to make the sacrifice not quite worth the cost.